It was another meaningful milestone for Tan Holdings group of companies and Tan Siu Lin Foundation to have participated at the 19th Annual Sophia Walk which commenced at the Fiesta Saipan Resort & Spa Saipan last June 23, 2018. 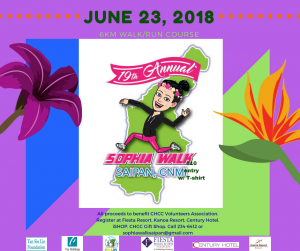 Named after the former first lady Sophia P. Tenorio, Sophia Walk aims to frame the benefits of long walks and at the same time, raise funds for the improvement of CNMI’s hospital. As a celebration to the event, Tan Siu Lin Foundation also gave commemorative T-shirts for the first 500 participants. Over $5,000 was raised during the Sophia Walk event, proceeds will go to the CHC Volunteers Association, a group of volunteers at the hospital.